The NBA is a league of basketball teams in the USA. It was formed in the late 1940s and has 30 teams, playing in two conferences (the Western and Eastern), but has a global reach with TV rights sold in over 200 territories around the world (NBA, 2016). Most teams are very wealthy with the average team being worth around US$1.3 billion (Smith, 2017). Interestingly it is one of the few sports leagues which are not national leagues – the NBA includes one team from Canada, based in Toronto. The map below (NBA, 2017) shows the locations of the teams in the full NBA (not including those in associated leagues like the D-League, a minor NBA league). NBA, 2017. Team Locations and Contact Information. http://www.nba.com/nbaatwork/Team_Locations_and_Contact_Inf-5_6.html Accessed 24th November 2017. There is a greater concentration of teams in the east and north east of the USA. The NBA is a major sports league. As such it has high attendance at games and large stadia. For example, the Chicago Bulls’ stadium holds over 20,000 people. Therefore, it is to be expected that the teams are found in places with a high population. This is indeed the case if the teams’ locations are compared to the population density in different parts of the USA and Canada. 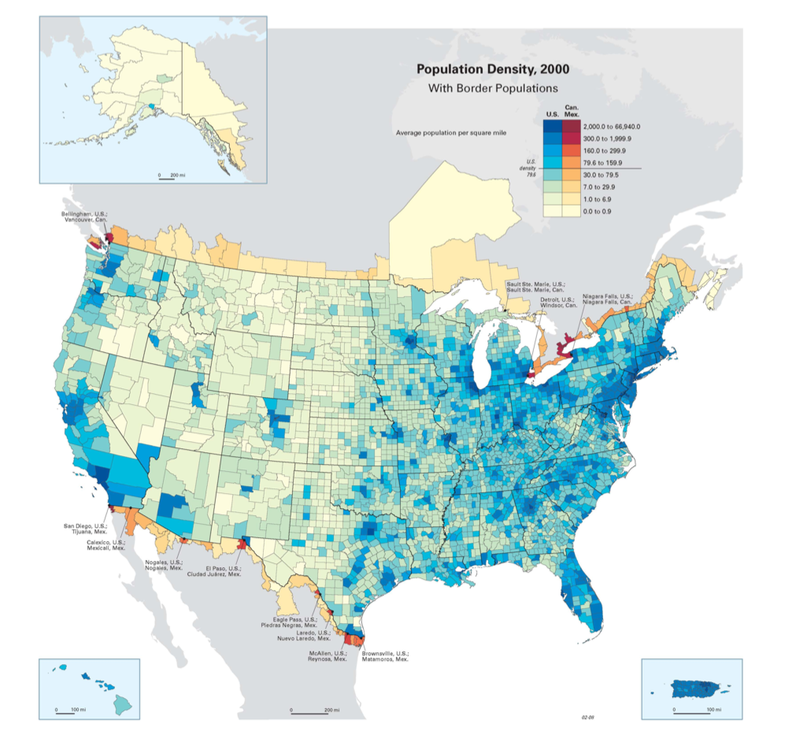 Map of population density in USA and border regions. Source: Anonymous, 2008. No title. https://cohn.files.wordpress.com/2008/04/population-density.png Accessed 24th November 2017. It’s possible to see a north-east concentration of teams that is not entirely explained by the distribution of population. A factor that can explain this is history. In 1946 the NBA was firstly created by joining local leagues in the north east. Over the course of the NBA’s history, the league has grown resulting in the number of teams today. The Original NBA. SB Nation, 2017. http://cdn0.vox-cdn.com/uploads/chorus_asset/file/679892/original-nba.0.jpg Accessed 24th November 2017. The teams also appear to follow the distribution of economic output across the United States. The map below shows how economic output is highest in places which have a high concentration of NBA teams (HowMuch, 2014). Note that this is not a per capita value, but a total value. In this case, the total value is more useful than a per capita value because we want to see how much money might be available in an area for sponsorship, ticket sales and so on. It’s notable that several teams have names that don’t quite seem to make sense! For example, the Memphis Grizzlies is named after the grizzly bear (more properly known as the North American brown bear), which are found in more northern areas. The name ‘Grizzlies’ was originally obtained when the team played in Vancouver. The team moved in 2001, and while it changed its name to reflect its new location of Memphis, the team mascot was retained. SB Nation, 2017. 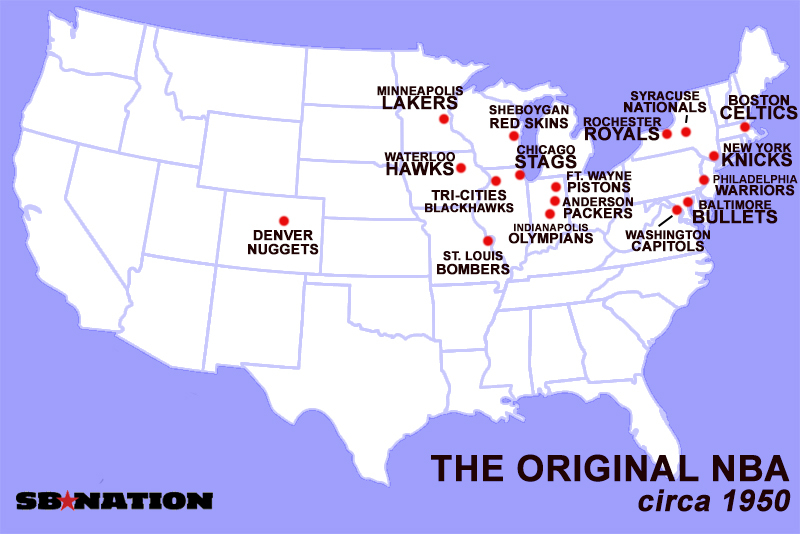 20 Maps That Explain The Nba. https://www.sbnation.com/nba/2014/10/23/6981895/20-maps-that-explain-the-nba Accessed 24th November 2017. The reason for the move was partly because of the location of the team in Canada. Because of the difficulty of fluctuating currency values, the cost of the team salaries had increased over time (Beamish, 2011). Meanwhile, issues such as attendance, exposure to advertisers, and local government support all contributed to the decision to move. The overall result is that today teams are often found in places which offer the most financial reward – that is, which locations can offer a high-value sponsor. Interest in NBA basketball is high, with over 20 million viewers for the final of the 2016-17 season (Holloway, 2017). Supporters are generally found near to the location of the teams. This is partly explained by the ability to attend fixtures, but the maximum attendance per game is usually under 20,000 (in part limited by the size of the stadia). Therefore, it is more likely that the distribution of supporters is influenced by local pride and news coverage of local teams, and the direct impact of the sponsorship links advertising and teams in the local area. Giratikanon, T. et al, 2014. Which Team Do You Cheer For? An N.B.A. Fan Map. https://www.nytimes.com/interactive/2014/05/12/upshot/12-upshot-nba-basketball.html Accessed 24th November 2017. The distribution of supporters is growing internationally. China is becoming the most important non-North American market for the NBA, partly as a result of the growing wealth of the country and its increasingly outward looking population. Interest has been garnered thanks to the 2002 signing of Yao Ming by the Houston Rockets. In the 2007-8 season, one game featuring Yao was watched by over 200 million people. Yao’s Chinese nationality has been a key feature in opening up the game to a new demographic in China (Blinebury, 2016). Another reason for the growth is the number of people in China who are interested and, thanks to technology, can now access the NBA via TV and other media. It is also because of deliberate promotion: over 400 games were shown free-to-view in 2016-17, and the season final was watched by over 200 million people on mobile phones alone (NcNicol, 2017) as part of a deal between Chinese technology companies and the NBA. Anonymous, 2008. No title. https://cohn.files.wordpress.com/2008/04/population-density.png Accessed 24th November 2017. Beamish, M., 2011. NBA dreams rekindled, 10 years after Grizzlies’ demise. The Vancouver Sun. https://web.archive.org/web/20110223095019/http://www.vancouversun.com/sports/dreams+rekindled+years+after+Grizzlies+demise/4315895/story.html Accessed 24th November 2017. Blinebury, F., 2016. Basketball has become ‘part of the Chinese culture’. http://www.nba.com/article/2016/10/07/nba-and-china-growing-relationship#/ Accessed 24th November 2017. Holloway, D., 2017. TV Ratings: NBA Finals Is Most Watched Since 1998. http://variety.com/2017/tv/news/tv-ratings-nba-finals-1202464230/ Accessed 24th November 2017. McNicol, A., 2017. How the NBA became China’s most popular sports league, with a boost from tech giants such as Weibo and Tencent http://www.scmp.com/sport/china/article/2112972/how-nba-became-chinas-most-popular-sports-league-boost-tech-giants-such Accessed 24th November 2017. NBA, 2016. NBA Frequently Asked Questions. http://www.nba.com/news/faq#/ Accessed 24th November 2017. Smith, C. 2017. LeBron James Passes Cristiano Ronaldo On Forbes SportsMoney Index. https://www.forbes.com/sites/chrissmith/2017/02/15/lebron-james-passes-cristiano-ronaldo-on-forbes-sportsmoney-index/#184e15731388 Accessed 24th November 2017. Does there appear to be a link? Why do you think this does (or does not) exist?